ZenPhoto (mixed) it says 100% success rate but it only solved 1 out of 400... — . :: GSA SEO & Marketing Forum ::. reverse prox = 3 times. @sven please help. whats wrong the my settings? Obviously you can see yourself that the captcha has changed from what CB is expecting. It needs to be changed to again solve any correctly. Oh i get your point so now it needs a new captchas.. hope @sven can update it..
that captcha got recognised as a wrong type but as that ZenoPhoto engine is only solved if the crc value of the b/w image matches, it is not giving any reply to it. It's actually another captcha type that is however not solved by a very low success rate and then skipped. 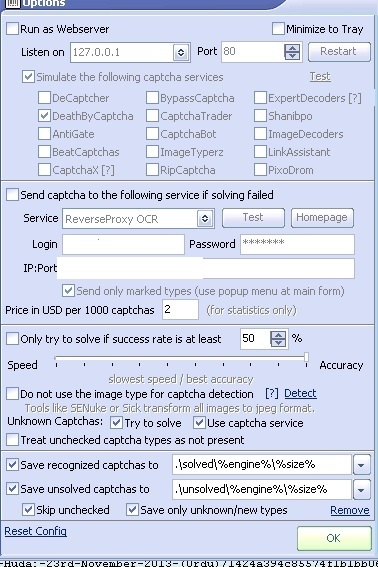 Sorry I know it's a bit confusing but solve rate is not getting better even if the correct captcha type was used. @sven so what should i do now to improve my gsa cb to solve the captcha? I try to change the detection on that captcha type for next release. However that original VimP captcha is hard to solve right now. Didn't had much time looking into it. Actually i have saved unknown captchas and unsolved captchas. Would you like to have them? Maybe you can use it? I could indeed need a couple of those new ViMP captchas but only with correct answers as file name. rghost.net and send me the url in pm. then it has wrong answers anyway. ViMP only has "123456789ABCDEFGHJKLMNOPQRSTWXYZ".